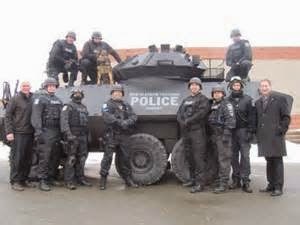 As we wait for the grand jury verdict on whether to indict Ferguson police officer Darren Wilson for the killing of Michael Brown, schools in Ferguson are preparing to close, the police are stocked up on riot weapons and white supremacists are pledging to kill. A sand-colored, mine-resistant military vehicle was seen parked in front a local Dairy Queen. Protesters are organized and eschewing violence for clever forms of civil disobedience, but know they will likely face violence: Missouri Governor Jay Nixon has already declared a state of emergency in Ferguson. Armored trucks in the street and a fear of mayhem are more common abroad, but Ferguson shows they now have a place in the suburbs of America. Police have militarized from to boots to brainstem. Police antagonized Ferguson residents from the very beginning and the world watched when they later teargassed and shot rubber bullets at people indiscriminately. Out of view of the cameras, there's also widespread surveillance and secret harassment of activists. Last month, Daily Kos' Shaun King posted a lengthy round-up of the behind-the-scense trampling of protestors' rights. Protest leaders are receiving hangup calls from unknown numbers; police are jotting down license plates. A Palestinian-American activist named Bassem Masri was arrested on October 15 with others, but was held for longer than any of them. Police threatened to hold him for a long period of time if he didn't spill the beans on other protesters, which he says he did not. King draws a parallel to the FBI's COINTELPRO (counterintelligence program) of the 1960s that targeted leaders like Malcolm X, Coretta Scott King, Angela Davis, Martin Luther King and Jackie Robinson. But police today are much more adept at intelligence operations than they were in the '60s, and all over the country, they're the first line of defense in spying on alleged threats. They're assisted by the Department of Homeland Security, which has spent over a billion dollars to create intelligence-sharing platforms (called fusion centers) connecting police departments to federal agencies (especially the FBI).